The Dwarf Century Plant, Agave desmettiana ‘Variegata’, can be a great plant for the office. 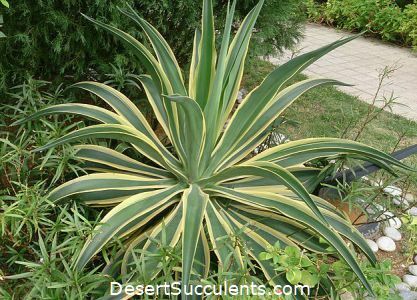 The Agave desmettiana is a perennial with attractive rosette-forming dark blue-green leaves. This small succulent is an upright agave which forms an upright urn-shaped rosette. The leaves are rigid, thick, rigid, linear-lanceolate and fleshy. The leaves have smooth margins with a single sharp reddish terminal spine. The leaves can be 3 feet long by 4 inches wide. The leaves are usually bright green and have yellow variegation accentuating the margins. Along those margins are spines that are minute or almost nonexistent. The Dwarf Century Plant grows somewhat quicker than most succulents and usually produces many offsets that can be propagated. This will grow into a dramatic, architectural-like structure that makes it a great choice for any garden. This agave looks good in desert, minimalist landscapes. Mature Size: Height 3 feet; Span 4 feet. Uses: Is used in offices and as houseplants. It also grows well outdoors including xeriscapes. These make a great focal point for any setting. Light: It needs full sun to thrive. When placed by windows the Dwarf Century Plant is one of the best plants for office settings. Soil: Any cactus potting preparation will work. Flowers: These plants flower just once sometime between 8 – 10 years. The flower stalk rises up from the center of a rosette and can reach 8 feet tall. The pale yellow flowers bloom in clusters in the spring and early summer. Water: Water only occasionally when the soil has completely dried to the touch. Propagation: Propagation can be from seeds. Let the pods completely dry while still on the plant before harvesting the seeds. These also produce many offsets that are easy to separate to grow new plants. Repotting: Seldom needs repotting and only when it has outgrown a pot. Pruning: The sharp spine on the tips of the leaves can be trimmed off with no damage to the plant. It is a good idea to do this in high foot traffic areas of the home or office. The juice or sap may cause acute dermatitis producing reddening and blistering. This condition can last for two weeks but itching may continue for up to a year. The Dwarf Century Plant is not patented. Synonyms include Agave desmetiana, Agave miradorensis, Agave regeliana, Agave ananassoides and Agave de-meesteriana. The Dwarf Century Plant will attract many birds and butterflies.